Great family days out down on the farm at Old MacDonald's Farm, whatever the weather! Come rain or shine there's always something to do here at Old MacDonald's Farm. You can enjoy all of our outdoor activites including thrill rides, the carousel and trampolines and when the weather isn't so great come and burn off some energy in one of our 2 indoor Soft Play zones! We have some fantastic indoor activities. Your kids will go barmy in the Battle Barn which is our brilliant ball games and soft play area. They can fire the plastic balls at targets and watch them zoom around the barn. If you like a show we have all new updated animated displays telling hilarious tales about life in and around the farm and you may even learn a thing or two. We have an awesome new adventure area Super Scramble with brilliant bridges and adventure towers. If you want to go for a wacky walk follow our Crazy Cow Trail and see if you can spot our crazy cows dotted around the farm. If your kid's like big trucks and lorries wait till they see our new Combine Harvester play machine or even get lost in our fun maze! Your kids just won't stop having fun with our awesome outdoor activities. Let your family enjoy their very first Roller Coaster experience on our wonderful Doggy Dog ride. Height restrictions apply for our rides - Please note: To ride the Amazing Crazy Barn riders must be over of 0.95m accompanied with an Adult or over 1.06m unaccompanied. Riders must be over 1m to ride the Doggy Dog roller coaster. We dare you to take on the Crazy Barn! 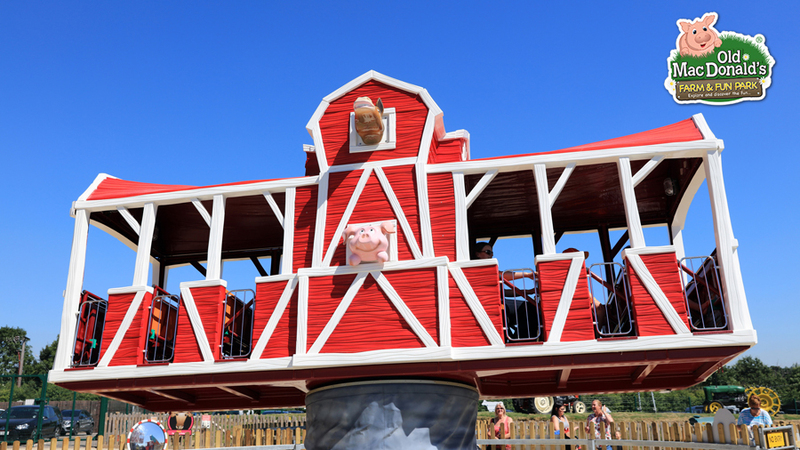 Brand new and exclusive to Old Macdonald's Farm is the thrilling Crazy Barn ride which is guaranteed to put you in a spin! Why not check out our new ride on Old Mac's YouTube channel? Kids need entertaining during the school holidays? Look no further! Old MacDonald’s open farm is a haven for kids during the school holidays. We have lined up lots of exciting activities all over Spring break, Easter holidays, half term, and Summer holidays. Come and see the baby lambs or take part in the Easter Egg Hunt around the farm. We have lots of special events throughout the year. ALL RIDES WILL OPEN ONLY WHEN THE WEATHER PERMITS. In low season times rides operate on a rotational basis and therefore staff may not always be operating them. If you wish to go onto the rides, please either contact a member of staff in the Shop or Café or if the ride has a button please press it to call for assistance.